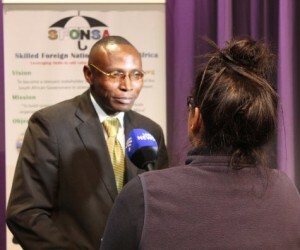 Contrary to the general belief and conception that migrants from the rest of Africa bring with them the issues of their own, Steve Arowolo, President of the Skilled Foreign Nationals South Africa (SFONSA), says there is enormous opportunity in embracing the skills that foreign nationals have brought into the country. This is the reason why the Department of Home Affairs gives special permits to people with special skills. It used to be called a ‘exceptional skills permit’, now they call it a ‘Critical skills permit’. Arowolo says those skills are critical to social and economic advancement of a country. Also, when you see skills as ‘essential goods and commodities’ without which development and other economic activities could be hampered, then you begin to attach more importance to it. Following SFONSA’s recent public lecture addressing the spate of xenophobic attacks against foreign nationals of African descent – and posing the question: “Could high impact entrepreneurship curb xenophobia?” – BBQ caught up with Arowolo, who enlightens us on the current state of affairs. What role can skilled foreign nationals play in boosting our economy? At SFONSA we encourage skilled foreign nationals to always see themselves as ambassadors of their countries, they should conduct themselves decently at all times, and this is the primary role. More importantly, our society needs to understand that skilled migrants have economic and social benefits. For instance, in South Africa, skilled foreign nationals are helping in the areas of jobs and employment creation. They help in skills enhancement and human capital development. And I will emphasise the human capital development aspect; if you visit South African universities, you will discover that in almost all the departments you will find at least one skilled foreign national either working as a lecturer or a researcher. Skilled foreign nationals are contributing immensely to South African society, especially in the education sector. And this is one of the things we at SFONSA want to leverage on to educate the general public more about the roles of foreign nationals in South Africa. We are also helping in the area of skills transfer, especially in the area of entrepreneurial skills of young South Africans. We have discovered that most South Africans are not entrepreneurial; we want to partner with relevant agencies to empower young South Africans in the area of business and technological skills. So this is not about ‘job grabbing’, it is about value addition. We are poised to contribute our quota in moving South Africa forward. Can you give us an overview of the challenges that skilled foreign nationals face in our democracy? The number one challenge, I would say, is the issue of ‘stereotyping’ and ‘undue profiling’ of people. And this is not peculiar to South Africans alone; I think it is in human nature to judge individuals based on the general notion of how people perceive their race or their type. Another challenge is that of getting the necessary permits and licenses. There are highly skilled foreign nationals in South Africa who are having issues with getting recognised by the relevant government agencies. There are highly skilled refugees and asylum seekers whose skilled are not yet tapped into, because they have not been documented. It is sad to note that many highly skilled economic migrants in South Africa are doing ordinary jobs as security guards, car guides, etc, just to make ends meet. At SFONSA, we are working towards how these issues could be addressed. Government shouldn’t be blamed for everything, and this is one of the reasons why we have SFONSA to help complement the efforts of the South African government. How does SFONSA intend to help lighten the weight of foreign nationals who want to enter the professional work force? We encourage skilled foreign nationals to contact us; we are developing a national database of skilled foreign nationals in South Africa. We can work with those on our database to navigate these challenges. And we are also working with relevant government departments and agencies to address this issue. How can government assist in helping these individuals to integrate into a democratic society and work force? I have said it before - government shouldn’t be blamed for everything, but one cannot over-emphasise the role of government.We want the government to form partnerships with relevant organisations like SFONSA to begin to address these issues. Big businesses, corporate organisations and private institutions should also come to the party, they should partner with us to address these issues. All we are saying is that the skills of migrants could be useful in advancing national and business agenda. Especially those skills that may not be readily available in South Africa. The turning point for me was when I was given a postgraduate scholarship by the South African government. It opened up my world, and enabled me to tap into some opportunities. I will forever be grateful to the South African government for the scholarships. It gave me a different perspective about South Africans altogether, and it’s the reason why I will never subscribe to a notion of calling South Africa a xenophobic nation. South Africa is probably the only country in Africa that has budgets for sponsoring foreign students, and the children of foreign nationals. There are thousands of foreign nationals in South Africa who have benefitted from the South African scholarship schemes, and I think that should be emphasised. It should be mentioned in our narratives of what qualifies or disqualifies a nation to be xenophobic. I am inspired by the magnanimity of the South African government, and it’s the reason why I mobilise the support of my colleagues to champion the cause and culture of ‘giving back’ to a country that has empowered and upskilled the vast majority of foreign nationals in South Africa. Presiding over the affairs of the Skilled Foreign Nationals in South Africa (SFONSA) is one of the ways I am giving back to society, and the country that has empowered me and many other foreign nationals. The recent xenophobic attacks and the nature in which it was handled have been a huge blow to South Africa’s international image as a democracy. What advice do you have to fix / undo the harm done – especially focusing on strengthening relationships with other African countries? Yes, it was a big blow. The nation may not be able to undo the harm, but we all can begin to work together to build structures that could help forestall the occurrence of such dastardly acts. I think relevant agencies need to work more with foreign nationals and the local communities. My organisation, SFONSA, is doing something about it. We shall soon launch a community project that will provide a practical solution to the perennial xenophobic attacks in South Africa. You will recall that we recently organised a Public lecture on xenophobia, where we had the Honourable Deputy Minister of Home Affairs, Ms Fatima Chohan, as our keynote speaker. The public lecture was a huge success, and we are taking it forward to become an annual event, where we will be inviting key government officials and the business community to come speak about these issues. I think people often wait until the crisis strikes before talking, and before doing something about it. We are changing the paradigm; we are putting in preventive measures to address xenophobia in South Africa. Where do we start in finding solutions? Can you tell us more about the work you do at SFONSA? SFONSA is a registered not-for-profit organisation based in Cape Town. SFONSA seeks to support and complement the efforts of the South African government by voluntarily supporting skills enhancement initiatives. SFONSA works towards ensuring that the community of skilled foreign nationals in South Africa could help address some societal vices and challenges (such as drug addiction, HIV/AIDS, xenophobia, the skills gap and youth unemployment), through community engagement activities, and official participation in public and private initiatives already aimed at addressing these issues. SFONSA believes that there is beauty in diversity, and it intends to showcase the talents and cultural heritage of foreign nationals in South Africa, by devising means on how the skills of its members could continue to add value to the economy of the Republic of South Africa, through diverse projects and programmes. We promote and support initiatives aimed at strengthening local skills enhancement as a crucial pillar of the New Growth Path target of ‘five million new jobs’ for South Africans by 2020. SFONSA seeks to also identify the South African national skills gaps, and provide intervention by voluntarily supporting skills enhancement in the needed areas/sectors (such as supporting mathematics and IT education in South Africa’s academic sector). We work to empower youths and women from local communities in South Africa, through entrepreneurship training and business skills initiatives. We are seeking the help of the government to develop an information hub and database for skilled foreign nationals in South Africa. This would assist relevant stakeholders and government departments (the Department of Home Affairs, Development of Labour, Department of Trade and Industry) to access relevant information as they would require. We also collaborate with foreign embassies and high commission offices based in South Africa, with a view to harness the skills of their citizens in order to promote investment opportunities among stakeholder countries. In general, we leverage the skills and experiences of skilled foreign nationals to add value to the South African society through partnerships and collaboration with different stakeholders. Do you think enough leaders (whether political, cultural, community or religious) have spoken out to condemn the lawlessness we saw with the recent xenophobic spree? Yes, I think the political leaders have played their parts well. The President came out to speak about it and condemned the act, and the Imbizo organised by the Zulu king also helped douse the tension. Parliament also played a very crucial role; they gave the issue a full session, and that to me was very commendable. But more still needs to be done with our community leaders, and this is the reason why SFONSA will be working with community leaders across the country to address this issue. Regarding the recent xenophobia public lecture: Did SFONSA achieve its goal - and what is the most important thing that came out of that session? The key message for me from the public lecture is that migration issues should be seen as one of our civic obligations, we all should wage a war against illegal migration in South Africa. Illegal migrants are threats to our collective existence as people, we should not harbour them. When a person is not well documented, they can easily break the law, and there will be no ways to trace them. 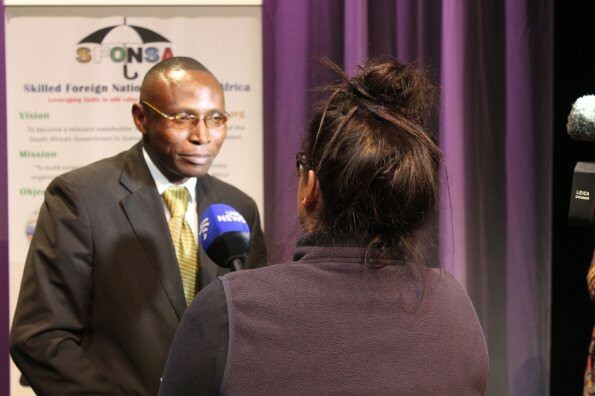 SFONSA is well positioned to work with relevant agencies to curb the illegal migration in South Africa. The public lecture was a huge success, and we have received positive feedback. One is that we should make it an annual event. I also want to thank our partners, without them the public lecture wouldn’t have been a success. We thank Artscape, Cape Media Corporation, and all our guest speakers.